This exhibition by Etsuko Ichikawa (Japanese, b. 1963) is comprised of a series of large glass pyrographs (drawings created with molten glass on paper), thousands of suspended cotton threads and a video projection. 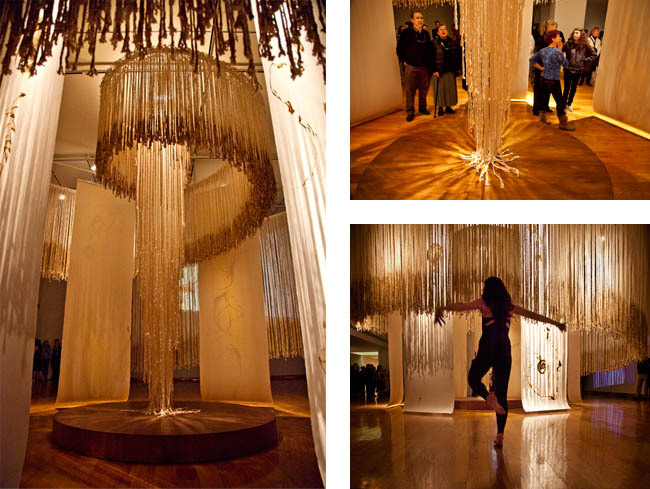 Ichikawa's multi-media installation was inspired by the Kumano waterfall, Nachi, which has been a destination for worship and purification for 1,200 years. The installation creates a space for museum visitors to experience silence and reflection. Ichikawa was in residence for four weeks in the UW Art Department and at the UW Art Museum to work with students and assist with the museum installation. Funded in part by an anonymous donor, the Andy Warhol Foundation for the Visual Arts, the National Endowment for the Arts, the National Advisory Board of the UW Art Museum, Wyoming Public Radio and the Wyoming Arts Council through the Wyoming State Legislature and the National Endowment for the Arts, which believes a great nation deserves great art. Click here for the Etsuko Ichikawa: NACHI – between the eternal and the ephemeral – curricular guide. Japanese artist Etsuko Ichikawa discusses her mixed media installation created for the University of Wyoming Art Museum.